Are you familiar with Beauty Without Cruelty (BWC) products? I am here today with a brand introduction as well as a BWC Nail Colour and BWC Sensuous Mineral Shadow review. IF you have not noticed this brand yet, be sure to take a peek into your local natural foods store or co-op for these beautifully packaged cosmetics! Beauty Without Cruelty or BWC is a cruelty-free natural skincare and cosmetics company. You can find these cosmetics online as well as at your local health food or natural foods store. This company was originated in England in 1963 and was a front-runner in the innovation of cruelty-free products. BWC has been available in the US since 1989. BWC offers cruelty-free and vegetarian products for skin, body, and hair as well as an entire line of color cosmetics. I know that purchasing natural and cruelty-free products is very important for many of my readers. So, know that when you are shopping with BWC you can rest assured that you are making your purchasing decisions with compassion. I have detailed the company's "Formulation Principals" below. BWC products are available at www.beautywithoutcruelty.com and your local health food store. First of all, I have to state how pretty this packaging is!!! The overall look is modern, yet artsy. The products feature decorative patterning of embedded swans that look like a swirl pattern. Very cool! These products are ones you would want to display on your vanity as they are so lovely! This shade Heather Mist is such a lovely color!!! It is a metallic lavender. So pretty!!! Pastel colors are hot for spring and I just love wearing this color! I am really nuts about any shades of purple or lavender, so this polish shade is right up my alley with its beautiful lavender shade (and the fact that I am a nail-polish fanatic, lol!). The packaging is sleek and it features the artsy swan design on the cap. Very pretty to look at! The website states that it is a quick dry formula and "chip proof". I did notice that this polish dried very quickly. The applicator brush is dense and somewhat flat (like an oval)which allowed for a very smooth and quick application. The formula is very pigmented and opaque. I only needed 2 coats for a perfect finish. It applies nicely and streak free! As far as it being "chip proof", I found that it wears about as well as any other good quality polish. I had some slight chipping after 3 days (which is pretty typical for me with how "hard" I am on my nails). Ingredients: Ethyl Acetate, Butyl Acetate, Nitrocellulose, Adipic Acid/Neopentyl,Glycol/Trimellitic Anhydride Copolymer, Isopropyl Alcohol,Trimethyl Pentadiol, Diisobutyrate, Triphenyl Phosphate, Butyl Alcohol, Stearalkonium Hectorite, Titanium Dioxide, Ferric Ferrocyanide, Red 6 Lake, Mica. *note: I got some clarification from my contact at BWC: Since Polish is a "Lacquer-based" product, it does contain some chemical compounds, so these polishes are not a natural products. But, BWC adheres to polish standards set forth by the natural products industry. BWC polishes are phthalate, formaldehyde and toluene free. The smell of the BWC polish is the same as a typical drug-store or high-end nail polish, but there is a difference in ingredients. As a nail polish lover, it is nice to know that there are products available on the market (like these from BWC) that contain less harmful ingredients. Overall, a big rave for this polish! These polishes are available in 16 shades and I would really love to try more! Any mineral shadows fans out there? 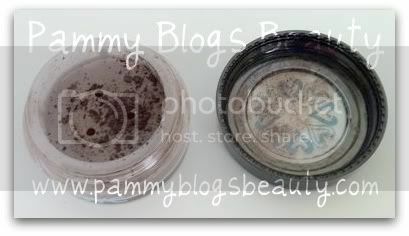 I know that there are so many brands of minerals out there, but these BWC Mineral Shadows are worth checking out! 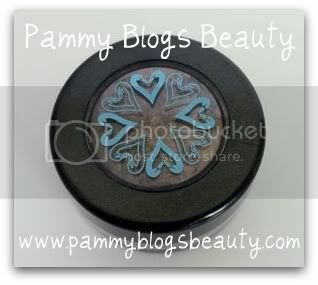 These are loose mineral shadows that come in a small jar with a screw top lid and a sifter. Each jar contains .05 oz of shadow. Ingredients include: Mica, Black Iron Oxide, Titanium Dioxide. Retails for $24.95 each. They are available in 10 shades. The shadows can be used wet or dry; When applied with wet brush, colors are much more intense. I, personally, like to apply them dry over a primer. Just like the Nail Colour, the packaging is so beautiful! I love the artsy swan design on the cap. The swan design looks like tiny hearts in a circle. very creative! It really makes this little jar of mineral shadow stand out amongst my other mineral shadows that have plainer packaging. LOVE the design of this one! This shadow packs in *major* pigment! What a beautiful and unique color! It is a dark brownish-taupe with shimmer/sparkle. The color is so complex! It is a beautiful brownish-taupe shade that has a metallic copper sheen. In some lighting it almost looks purplish-brown on my lids. What a dimensional and unique shade! I especially like wearing it on the "outer V" and crease. It is a very flattering color! It applies beautifully and blends well. I like this applied with a small pencil brush along the upper lash line and to the "outer V" and with a fluffy crease brush through the crease. This shade gives beautiful depth and dimension to my eyes. The color itself really makes my blue eyes pop! It wears well all day with no problem! In summary, I am totally impressed with Beauty Without Cruelty products. I admire their environmentally concious ethics and their strive to create safer products. Yes, these products are expensive. But, at least you know that they are putting quality ingredients in the products that are safe and cruelty free. Plus, I am sure that you can find some deals or sales online. I know that I would really like to explore this brand more as I love both the mineral shadow and the Nail Colour! I hope you enjoyed reading this review! Stay beautiful my dears! These look really cute! I'm so glad they're cruelty-free. Do they do brushes? I hate buying brushes because I can't tell if they're synthetic or made from animal hair. I don't like purchasing products which violate Animal Rights, so if I had access to these in Bangladesh I would definitely buy them! The nail polish sounds great and looks pretty for Spring, but it's full-on Summer here so I'm on to bright nail colors. These polishes sound expensive though, at around $16. Hi Rizzie! I agree, and want to explore more brands with animal and environmentally friendly policies. I do not believe that they make brushes.